If you have been in the Short North any time in the past couple of decades, you have seen Malcolm J. His wonderful artwork and friendly personality are part of the fabric of the neighborhood. Although he has had many challenges throughout his life, Malcolm has maintained his creative spark and his kind and gentle demeanor makes him a friend to many of us who call the neighborhood home. On Thursday, March 1, Malcolm was attacked in a neighborhood bar by a man wielding a beer bottle. He is currently in the OSU Medical Center where we are told he is in danger of losing his eye. Although details are still sketchy, I wanted to get this fundraiser up and running as quickly as possible. Because of his limited resources, Malcolm will surely need financial assistance to bounce back from this episode. In addition to all of the other lousy aspects of this situation, Malcolm is going to miss out on one of the biggest Gallery Hop nights of the year (The Arnold) and this will surely mean a great financial loss. I will continue to pursue this matter and will post updates here as I know more about Malcolm's condition. Meanwhile, I would like to get a little nest egg together for him so we can make his recovery as comfortable as possible. I am getting ready to deactivate this account, and I wanted to take this opportunity to thank everyone who pitched in to support Malcolm during this difficult time. Initially, I hoped to raise $1000 or so to help him through this trauma, and it didn't take long for this campaign to wildly exceed all of my expectations! Through GoFundMe, and other fundraising efforts, we have amassed a very nice nest egg for Malcolm to use as he recovers and gets himself back on secure footing. When this story became widely known, an amazing group of people stepped up to help, and many of them continue to provide support and encouragement as Malcolm continues his journey. To all of you who gave money, time, resources and support I just want to say thank you! Malcolm continues to recover from his injuries, and will soon be moving into a new apartment, hopefully close to his beloved Short North. He made his return to Gallery Hop last weekend, and with the warmer weather, he is ready to get back out on High Street to sell his art and be his gregarious and social self. Now, more than ever, it is so important for communities to come together and support each other, and this campaign was a truly great reminder that together, we are stronger. Hello everyone! It has been a while since an update, so I wanted to fill everyone in. Malcolm remains at the Laurels of Norworth where he continues his recovery. He , unfortunately will not regain any use of the injured eye, but will receive therapy so he can learn to make the best use of the vision that remains in his other eye. 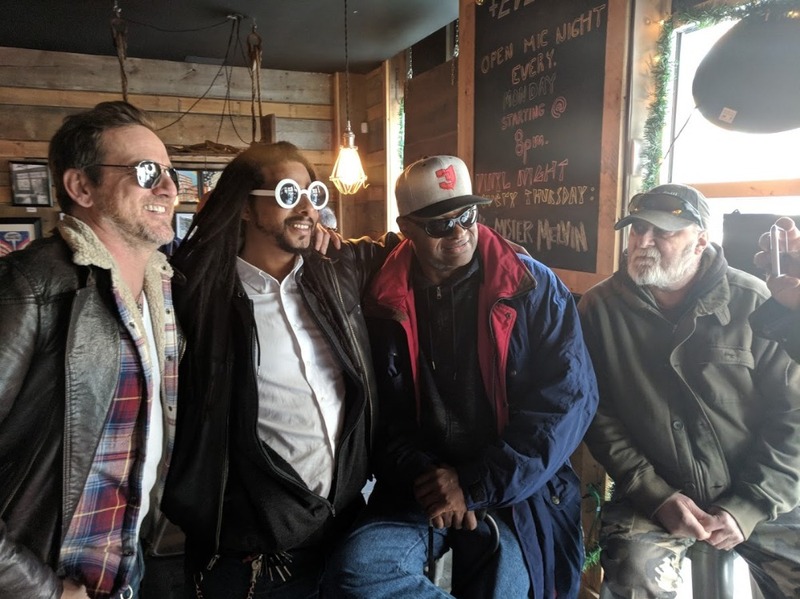 A few exciting things have happened in the past month- our fundraiser at the Short North Stage was a big success, and we raised around $4000 for Malcolm's recovery fund. Last night, Malcolm participated in the Short North Gala, where he sold his art and met with friends from the community. In July, Malcolm will be among a group of local artists of color who will have their work displayed as murals in the Short North in honor of the anniversary of the Harem Renaissance. I would also like to let everyone know how funds raised here will be disbursed to Malcolm. So that we do not jeopardize his much needed public assistance, funds raised here will be deposited into a savings account in my name, that will be administered by myself and a second party of Malcolm's choosing. This money will be distributed to Malcolm at his discretion for his needs. Thank you again to everyone for their support, it means the world to Malcolm and has helped him so much with his recovery. He plans to make his triumphant return to Gallery Hop next Saturday, May 5. Come down to the Short North to say hi! The support and love for Malcolm continues to be truly inspirational. He is currently getting occupational therapy at the Laurels of Norworth where he will be living through the end of the month. He will then transition to a more permanent, assisted living situation. He has been rendered legally blind, so he will also look for new outlets for his creativity. He remains optimistic as ever, but is understandably a bit overwhelmed. The expenses related to his treatment and care will be huge as you can imagine, so I would like to invite everyone to attend a fundraiser on Monday, March 26 from 6-8 PM at The Short North Stage 1187 N High St. Art, Music, Love- An Evening for Malcolm J will feature entertainment, an auction of art by Malcolm and other local artists and food from local restaurants with a cash bar. The suggested donation will be $10 at the door. Thank you all again for your continued support. I have attached a photo of Malcolm from yesterday, he was able to come out for a few hours to see friends at a House Beer, who kindly held a benefit for him at their Short North location. Thank you so much to Malory and all at House Beer!